The type of business you are running will determine the image you want to portray. For example, if you provide freelance services, potential customers may expect your profile to include a professional headshot and brief bio to explain what you do. However, if you sell office supplies and want to create a strong brand for your business, it may be more effective to use your logo and a brief mission statement on your profile. Spend some time considering the type of image you want to portray. Interaction is the most important factor in building relationships with other social media users. Businesses that fail to respond to comments or questions can draw negative attention that will affect their reputation. You don’t have to respond to every comment, but you should at least post a general response on your profile that lets people know you have listened to their comments. To maximize your online activity, try joining in with active conversations that are related to your field of expertise. Authenticity is one of the keys to success on social media, as other users want to interact with real people and approachable businesses. To develop an authentic voice for your online activity, you first need to know what the values and aims of your company are. Don’t be afraid to disagree with people or stand up for something you believe in, as long as it fits with your business values. Customers and other social media users will respect your honesty and willingness to stand by your values. Show potential customers that you have a proven track record of delivering on your promises. Businesses often use facts and figures to illustrate their success, although there are many different ways to prove your value. If you provide freelance services, use your social media bio to link to your portfolio or provide samples of your best work. Testimonials and positive reviews can also be extremely valuable. In addition, if you have any awards or certificates related to your business, consider including this information on your profile. 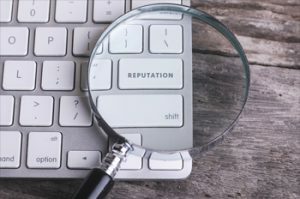 Building a good online reputation can make a big difference to your business and help to boost your marketing efforts. Portraying the right image, interacting with other users, being authentic and showing potential customers a proven track record of your successes can help to build your reputation.